When you open Evoke you will be asked to select the App design you wish to work on today. This is also a good time to check out the Evoke Context Menu. Select an existing App design using the drop down options. The "App" menu ("...") offers the opportunity to create a "New" App design or to delete an existing, already open App. A new app will create new boilerplate app design for you to work on, the new app will have a basic Login Page, a couple of blank Page Series and Pages, the mandatory entities and selections, and default values will be applied to all variables throughout the App Design. This base app design contains everything (the full technology pipeline/stack) needed for Evoke to generate a fully working App that will operate on all mobile and desktop devices. Whenever you wish to create a "new" app, record, selection, page, menu, etc within your Evoke app design you will always find "new" in the "..." ellipsis menu in a header. Open an existing App design option from the dropdown list of available versions for this app e.g. test, live, development, etc. New. Create a brand new app design version. This will create the "new" boilerplate App design but as a new version of the existing open App. Duplicate. 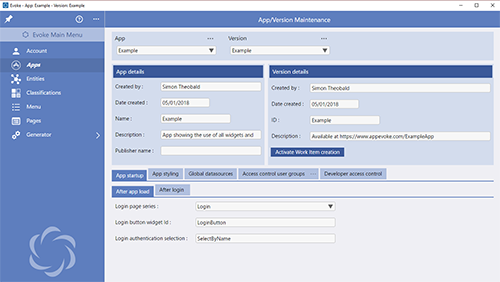 Create and load a duplicate copy of the currently loaded App design as a new version of the existing open App. This is also the option used when you wish for multiple developers to work on the same app design. Take a Snapshot. Use the Evoke Take a Snapshot feature to save, in the Evoke Snapshots database, a version of this App Design to potentially revert back to later. Revert to a Snapshot. Use the Evoke Snapshot feature to step back to a previous version of this version of the App Design as saved by you previously using the "take a Snapshot" function above. Created By An automatically populated entry that details who originally created this App design. Date Created An automatically populated entry that details the date that this App design was originally created. Name The name, that you choose, for this App Design. Description A free format description for this App Design that you choose. Publisher Name Used with native Apps, deployed/published to app stores. An optional free format Publisher name that you choose. Created By An automatically populated entry that details who originally created this App design version. Date Created An automatically populated entry that details the date that this App design version was originally created. ID The name, that you choose, for this App Design version. Description A free format description for this App Design version that you choose. Activate Update Logging Button. Used to link base versions of this app to Work Item versions - please see Multiple Users App Design Hierarchy section below. Evoke works on a Access Control hierarchy with Account the top level of access, this is set by company and is unique for each company that licenses Evoke. You enter the account credentials as part of the initial login screen. Within each account there are 1 or more users - these are defined by login name and password on the login screen. App designs within an account are stored centrally, held in a secure Azure account that matches the Evoke Account. Each app with an Evoke account may be accessed by multiple Users within the account, there is the option to restrict a user from an App design within the Developer Access Control area in Apps within Evoke. The reason for this is so that a company can have multiple people working simultaneously on different parts of the same App design. Please review the help pages regarding Multiple Evoke developers working on a single app design before you have multiple developers changing the same app design within Evoke. Each App can have multiple versions. The version option within Evoke allows for the duplication of an App Version to create a branch of the App design. Once again the Developer Access Control area in Apps within Evoke allows the App version owner to restrict who else has access to it. Users generally create an App, using the NEW option in Apps (as part of the App load/selection when you first open Evoke) and then restrict or offer access to this App design to others on their account if they desire this. The Demonstration App designs included in each users Evoke Account, such as the SOP app design, are provided as demonstrations. Users are encouraged to review these demonstration apps online as running apps and then are able to review the design in Evoke to see how something was done. Each of the demonstration App Designs are made available as shared designs to all the users on an Evoke account. The demonstration apps are provided without a local database so they can only be viewed online and then reviewed as a design. If you want to use one of the demonstration apps as a "seed" app to create a new App then either a) duplicate a new version of the demonstration app to modify and use (thus retaining the original demonstration app) or b) ask that BlueFinity create a duplicate of the demonstration app within your Evoke account under a new name so you can onward develop it.